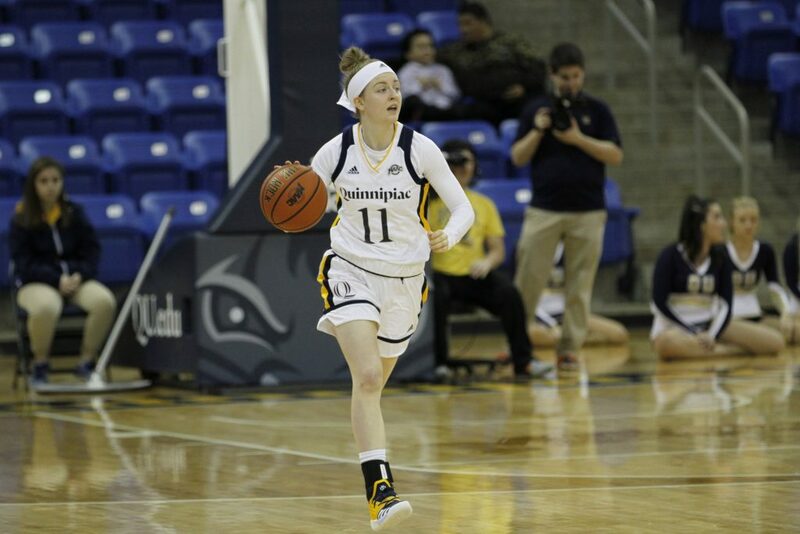 No Jen Fay, no problem for the Quinnipiac Bobcats women’s basketball team, as her third straight time out of the lineup still didn’t stop the team extending their win streak to 10 games in a row on Sunday afternoon. The Bobcats ((15-6, 10-0 MAAC) put together a tremendous team performance on the offensive and defensive ends against the Rider Broncs (11-9, 7-2 MAAC), winning 72-56. With scoring, rebounding, and assists leader Jen Fay out of the lineup for the third straight game, Quinnipiac forward Aryn McClure said the team had to find, “the next woman up.” In today’s game, McClure spoke true to her own words. McClure asserted herself as the top performer, scoring 22 points and shooting 59 percent from the field to go with eight rebounds. This wasn’t an unusual type of performance from the 5-foot-11 senior, as most of the time the Bobcats square off against the Broncs, McClure tends to have her better performances. McClure wasn’t the lone contributor to the team’s win, as Paula Strautmane did her part on the offensive end, scoring 18 points, including two threes. Besides scoring, the Bobcats smothered the Broncs on the defensive end. Quinnipiac held Rider to just 11 points in the third quarter, which set the team up for easy transition buckets, pulling ahead to a 12-point lead at the end of the frame. Head coach of the Bobcats Tricia Fabbri praised her team’s efforts on defense just as much as their scoring output. After another successful sweep of a MAAC opponent, the team will look to continue their winning ways with the next two games in their home stadium against the Niagara Purple Eagles on Thursday, followed by the Canisius Golden Griffins on Saturday.